Nearly HEPA performance at a fraction of the cost! Electro Breeze is the perfect retrofit to replace your furnace filter with a high efficiency whole house air purifiers. Simply remove your 1 inch filter and replace it with the Electro Breeze electronic air cleaner and plug it in. Your furnace is now a whole house air purifier cleaning 97% of airborne particles down to 0.3 microns (What is a micron?). Removing the harmful particles that become asthma triggers, allergy symptoms and multiple chemical sensitivity symptoms. Now you can rest in your own home in warm or cool temperatures. In fact, the more you run your furnace fan, the more you are cleaning your indoor air. 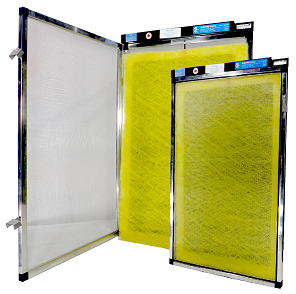 The size of your current furnace filter will be the size you order. Call for custom sizes (no extra charge). Your purchase will include: Electro Breeze air cleaner panel in your size, a 24 volt transformer and five replacement pads. The appropriate lead wire is also included for those who wish to wire directly to their furnace. Change your first pad after one month of use, then change out every 2-4 months, thereafter. What is the Electro Breeze air cleaner?